But, writing farewell thank you notes doesn't need to be a sorrowful affair. Take this opportunity to let people know that you appreciate what theyâ€™ve done for you over the years. There are many times throughout your life when writing a farewell thank you note may be in order. 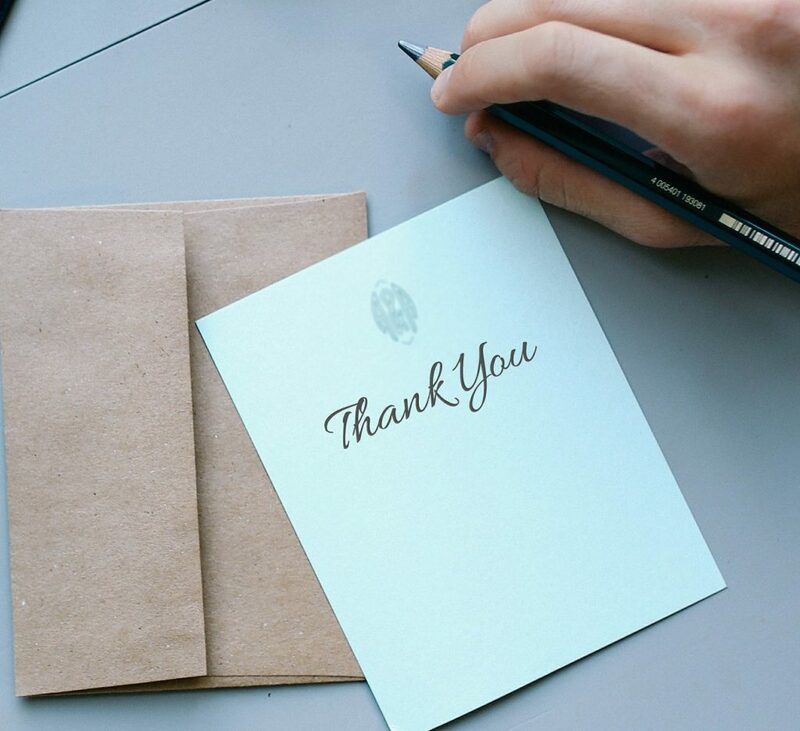 But, one of the more important occasions is writing a thank you note to your bosses and coworkers when youâ€™ve been promoted or moving on to a new job. Lets get to the sample notes. After my first morning here at my new position, I want to take a second to thank each of you for everything you did to prepare me for this new assignment. In addition to managing the insanely busy daily work flow, you provided me with opportunities to gain experiences that will be invaluable in my role, here. It means a lot to me to represent the work ethic that youâ€™ve cultivated at the DC office, and I hope to justify your confidence in me, as I now encourage those under me to the same level of teamwork and excellent public service. You should know that I was told by many people here that I have â€˜big shoes to fillâ€™ by replacing James. I feel confident that I'll meet expectations, because of all the help youâ€™ve given me in preparing for this new position. Now, if only I could find a Dunkin Donuts, around here . . I am leaving the company this week after two years here and just wanted to thank you for all the help you gave me during all that time. I know it wasn't the first ( or probably) the last time you've been asked to help train a greenhorn! You were so helpful I'm sure things wouldn't have gone so well for me here without your cheerful attitude and great drive to achieve and to help others do the same. I wish you all the best in the future here. It was on the first day of November, 2009 when we met as I joined as Vice-President in our office. We have been working closely together for the better part of the past decade. Days have never passed by without our seeing each another and you have been a moral support to me here at the office as well as at home. If you are not seen for a day my children start enquiring as to your whereabouts. Sometimes my wife gets jeslous. As you are aware, time has come for me to leave for Baltimore. My going on promotion may be happy news for all of us but it is sad news as well since weâ€™ll be parting. Though I hope weâ€™ll meet often either by our family visiting you and you visiting us, I am really pretty upset that weâ€™ll be so far apart. It may be a formality to say thanks to you; but from our heart of hearts we say a big thanks for having been our friends for the past ten years, providing us with good laughs, good company, and moral support. Iâ€™ll miss you friend. I am very disappointed that we have to move to new locations for our jobs. I am going to miss you very much . You really took care of me and helped me out a lot. I am here because of you as you were the one one who always use to give me moral support. Whenever I get a chance , I will surely visit you, and I hope that you will come down to LA to visit me as well. We had the greatest times. Though weâ€™ve only met this last year, it feels like I have known you for my whole life. We were always there for each other, whenever one of us was having a bad day. My life would be so different if you had never showed up in our office. You are my best friend. This is why I am very sad to be moving to New York. My husband has to go due to work. I hope we move back soon. I have so many memories here. Please keep in touch with me. You know my phone number, and I will give you my future home address when I find out what it is. You were the strength in my life from the day I met you. But you are no more now and I miss you so much. No one else will fill your place. You were the complete guide and my sweet love till the last day you spent with me. I never once heard you say"NO" to me ever in my life. And I want you back in my life as the same person. God has taken you too soon from me, and I hate God for that. He could have taken me, but he took you instead. Why? Please come back . I miss you very badly. I loved you too much and I can't be without you now. I am very happy to have a neighbour like you. You are such a good person and you were with me always helping me in any troubles I faced. That is not all, whenever we are gone for vacation and you are very keen to look after our home, so that we can enjoy a peaceful vacation without having to worry about robberies, etc. Though we will be moving, know that I am here to help if you ever need it. Iâ€™m just across town, and a phone call away.I hope you will visit often, and come try out our new pool. I do not know how to tell you how lucky I am to have met you and how grateful I am to have been your friend. Even if I do, I probably would not be able to say it right. I love you as a friend, a roommate and once, a lover. I honestly do not know how things would be here without you. It's been forever since I lived alone. We will both need some time to adjust. I understand your situation and I wholeheartedly believe that you have made the right decision. All the best to you and your family. As you know, I will be leaving for England after graduation. It has been a very difficult year for me and I would not of made it without you. I just want to thank you for all the late nights we spent studying together, and all the help you gave me wanting nothing in return. My flight leaves before you are scheduled to return and I am afraid I will not be able to meet you as planed. I hope things work out with you and Amy and wish you both the best of luck in the future. I am sure one day our paths will cross again. I hope these farewell thank you note samples help inspire you to write a grea thank you note. Check out these related pages, or submit your finished note below to help others! Help inspire others by posting your best farewell thank you notes below.